Hey! Remember my weird dream about the giant cat in the dungeon? 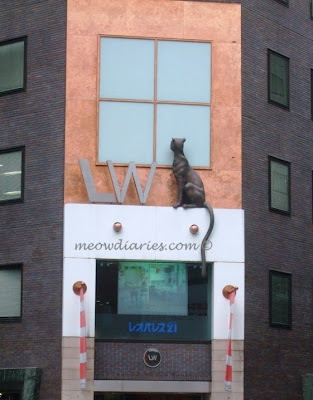 I had that dream right before my Tokyo vacation and guess what I spotted atop a building in the streets of Tokyo? The giant cat itself! I quickly snapped pictures of this cat to blog about and now it's here. How weird is that? And eerily enough, this cat looks pretty much like the one invading my dream! Vacationing in Tokyo was exactly what I needed to get my mind off things back home. It was a fun-filled albeit hectic week and it was a truly memorable vacation. And though it has only been two months since I went on a holiday, I am already looking around for a new vacation destination for B and me. I thought this time we could look into All Inclusive Holidays perhaps. An all inclusive holiday basically means that your accommodation includes all your food and drink as well as hotel activities and entertainment. This privilege begins the moment you arrive at your hotel destination until you leave. When vacationing in Japan, our food was not included as part of the hotel price. Everything had a price and we ended footing a pretty hefty sum just for food. With all inclusive hotel deals however; food, drinks and entertainment would be free of charge. We can save more on dining, leaving us with extra spending money for other vacation stuff like sight-seeing and of course shopping! The more I know about this all inclusive concept, the more enticed I am to pack my suitcase again and head off into the sunset with B. I hear ULookUBook is currently offering amazing all inclusive deals currently so perhaps I'll start my search there. With all the cheap holidays, discount hotels and last minute flights to thousands of holiday destinations worldwide, I'm sure ULookUBook will help me put together another great holiday - hopefully soon! hahahhahaah.... giant cat lah.. but hey very unique.. i love it!! :-$ :-$ :-$ :-$ :-$ :-$ RM PB hehe! I didn’t see u earlier Mon he he! Meow! Yeah long tail geli la me…. Sure feels slimy yowzaaaaa! Hahahah thanks sweetie, I just saved in draft all my TCM and TFC! But EC not yet….cause I haven dropped at all today lol! Kannnn? Why must it be huge and skinny looking like a wild animal like dat? Hohoho!! !